Just to recap: On Tuesday morning, 24 March 2015 I woke up before sunrise and headed alone up the hill to the top of Mt. Thesiger (Port St John’s – South Africa) at around this spot GPS: -31.603330, 29.527454. I spent the night before having a scrumptious seafood feast and filter coffee plus hot chocolate at @amapondobackers. I was photofit! 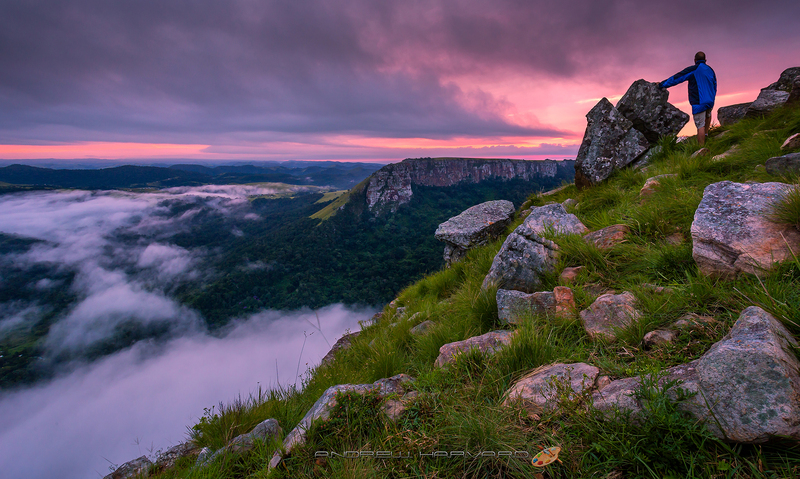 I set up my Canon South Africa camera (6D & Canon EF 17–40mm lens) and tripod in anticipation of the forthcoming sunrise. The river lodges were some 300 m or more below and I could faintly see their lights through the mist or low clouds. The accompanying photo is a self-shot image using the camera’s 10 second timer. Stunning photo. Well worth the effort put in to capture it. We just bought a tripod and remote for our camera and I can’t wait to try and capture moments like these.